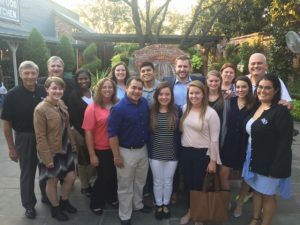 Last week, eleven COBA students attended the HRSouthwest Conference (HRSWC) in Fort Worth, TX. The HRSWC is the largest regional educational and networking event for human resource professionals. HRSWC is organized by DallasHR, the Dallas-based SHRM Affiliate Chapter. More than 2,500 HR professionals attended the conference and had the opportunity to hear from keynote speakers Laura Bush and John O’Leary, attend educational sessions, and connect with other professionals as well as experience new ideas and technology in the HRSWC Marketplace. Dr. Malcom Coco, Dr. Phil Vardiman, and students at the HRSWC. Society of Human Resource Management Sponsor Dr. Malcom Coco said the conference “was an awesome opportunity for the eleven attending students to meet and network with the conference attendees”. This conference provided an opportunity for the students to learn more about their discipline. It also helped them to determine if they wanted to go into the HR field, what part of the field interested them, and gave them an opportunity to meet hundreds of HR professionals to expand their individual network for possible future jobs. Tom Harris, a senior management major and full-time manager at The Men’s Wearhouse, was encouraged by Dr. Phil Vardiman to attend the conference so that he could connect with HR professionals. Harris said that his conversation with Linda Swindling was the standout of his conference experience. Swindling is a Certified Speaking Professional, “Recovering Attorney,” the past-president of the National Speaker Association, the current President of Journey On!, her own speaking and consulting company, and the author of more than 20 books. Harris talked with her at length before Swindling’s presentation about her history and experiences and was even called on stage during her presentation to share a few words. Harris said that the most helpful thing he learned at the conference was the importance of being intentional. Their full schedules during the conference required some creativity on his part so that he could connect with people. “If someone I wanted to talk to was in a hurry to get to a speaking session, I would try my best to be in a hurry with them,” he said. “Have your main course at one table, meet everyone that is sitting near you, shake their hands, and go get your dessert and do the same thing at a different table.” Harris believes that it is important to take advantage of every possible networking opportunity and felt that the HRSWC allowed him to do this and to practice his networking skills.